Born: 1852, Scarborough, Yorkshire, England. Died: 4 July 1917, Groenvlei Tin Mine, Limpopo, South Africa. Samuel M. Tweddill, son of William and Jane Tweddill, came to Natal from England in 1873 and six years later moved to the Transvaal. There he took part in the First Anglo-Boer War (1880-1881). He practiced as an analyst and assayer for many years, while pursuing mineralogy as a hobby. However, in 1888 he was listed also as a photographer in Pretoria (Bensusan, 1963). 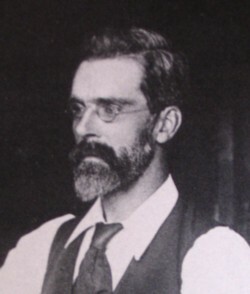 In 1894 he was appointed at the Staatsmuseum (later the Transvaal Museum) of the South African Republic, Pretoria, as assistant curator (succeeding Max Rossteuscher*), with responsibility for the geological and mineralogical collections. He was also provided with aparatus to perform chemical analyses. Late in 1897 the collections in his care were transferred to the Geological Survey of the republic, directed by Dr G.A.F. Molengraaff*. Tweddill was appointed curator of the Geological Survey's museum, as well as librarian, from January 1898. When Dr Molengraaff resigned at the outbreak of the Second Anglo-Boer War in 1899 Tweddill was left in charge as acting director of the Geological Survey. His position as curator of the collections was confirmed by the British authorities soon after the occupation of Pretoria in June 1900. He remained in charge of the institution until H. Kynaston* was appointed, at the beginning of 1903, as director of what was then the Geological Survey of the Transvaal Colony. Later that year Tweddill was co-author with Kynaston of the Administration report of the Mines Department for the year 1 July 1902 to 30 June 1903 (Pretoria, 1904), which included the first report of the renamed Geological Survey. During the next decade the staff of the Geological Survey systematically collected specimens of the rocks and minerals of the Transvaal for its museum in the course of their duties, while additional specimens were obtained as donations from members of the public. Such donations comprised about 90 specimens in 1903, but only a few dozen per annum in later years. A collection of fossils was initiated, as was a collection of building stones. Tweddill also arranged that the cores of boreholes drilled by or for the Public Works Department were deposited in the museum of the Geological Survey. Using the museum's laboratory facilities he cut and prepared many micro-sections of rocks and minerals. He also contributed "Museum notes" to the annual reports for 1904 (on some typical rocks of the Transvaal) and 1905 (on ruby-bearing rocks of the Leydsdorp district), and annually listed donations to the museum. In 1906 he was one of the persons interviewed by the Departmental Committee to enquire into the question of government laboratories. In October 1914, during World War I, part of the museum building was occupied by the military, thus limiting the display area. Tweddill continued his work despite the difficult circumstances, until his retirement in June 1916. Bensusan, A.D. 19th century photographers in South Africa. Africana Notes and News, 1963, Vol. 15, pp. 219-252. Chemical, Metallurgical and Mining Society of South Africa. Proceedings, 1899, Vol. 2 and 1903, Vol. 3: Lists of members and associates. Dippenaar, N.J. (ed.) Staatsmuseum 100. Pretoria: National Cultural History Museum, 1992. National Archives Repository (TAB), Source MHG, Vol. 0, Ref. 32185: death notice, Samuel Milbourn Tweddill. National Automated Archival Information Retrieval System (NAAIRS). . Documents relating to Tweddill, Samuel Milbourn / Tweddill, S.M. Staats-almanak der Zuid-Afrikaansche Republiek voor het schrikkeljaar 1896 (p. 103). Pretoria: Staatsdrukkerij, 1895. Transvaal Colony. Report of the Departmental Committee to enquire into the question of government laboratories. (National Archives Repository, Pretoria, Source TKP, Vol. 196. Transvaal Colony, Mines Department. Report of the Geological Survey for the year 1907. Pretoria: Government Printer, 1908. Union of South Africa, Mines Department. Annual reports for 1910, Part IV: Geological Survey. Pretoria: Government Printer, 1911.